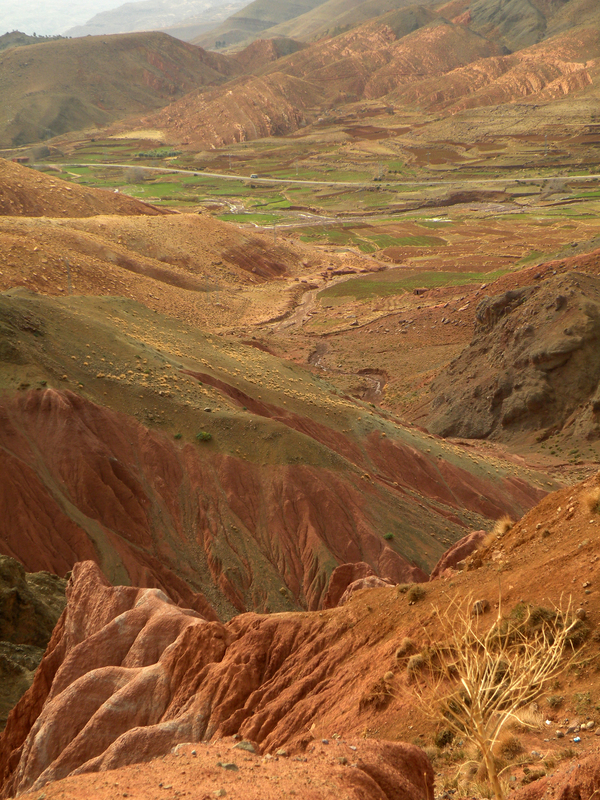 Our drive to Marrakesh took us through Atlas mountains. AMAZING! Wow. The road just wriggled like a snake between mountains. Precipice here, precipice there… I’m used to roads in Alps, Germany, Austria, Italy, France. I’ve been to Croatia and drove from coast to Zagreb (at some point the road seemed to be a front yard of house or restaurant) but road in Morocco really took my breath away. At one moment we found ourselves driving around the rock in U shape so narrow that we could barely pass a truck so how could two trucks pass each other? No idea but it’s almost like driving to Vesuvius with a trailer passing coaches. We got to Marrakesh without a city map. BIG mistake! We had a small map of the city center in the guide but it’s not enough, believe me. We were expecting signs saying: to medina or something like that and there are signs, it’s just that we found ourselves in the middle of old medina with no hotels. With narrow one way streets or streets closed for cars, thousands of pedestrians mainly natives walking in all directions not paying much attention to anything besides their business it’s a labyrinth where you can easily get lost. We were driving in circles looking for hostels or a way out. As you can imagine moods where not the best as each one of us had a different idea which way to go. Finally from the back seat I decided to ask for help. Lucky me I even found a really nice guy speaking English! He was kind enough to suggest he will show us the way, but the man in my car were not very found of this idea and told him rudely to get lost. Typical, nevertheless it made me really angry, cos we were waisting our time. We managed to get out from old medina and drove to the outskirts again. Really wide streets, kind of residential ringroad and almost nobody on the road. We stopped to calm down and discuss what to do next. We decided to drive around and find a hotel, which wasn’t hard. The difficult part was finding something within our budget. No luck there so we ended parking our car in walking distance to Souk del Bahja an go to an Internet Cafe and browse for hostels. We wanted to print out the map with nicest looking hostels and in result had to pay for around 60 pages of of which we needed only two. We couldn’t find anyone of the hostels on the map so we checked to the cheapest hotel we found on our way. Really nice room and a really nice service and parking space for our car! We had an evening walk around Marrakesh, very quiet and very tempting with orange trees along every street. Can you actually eat them? 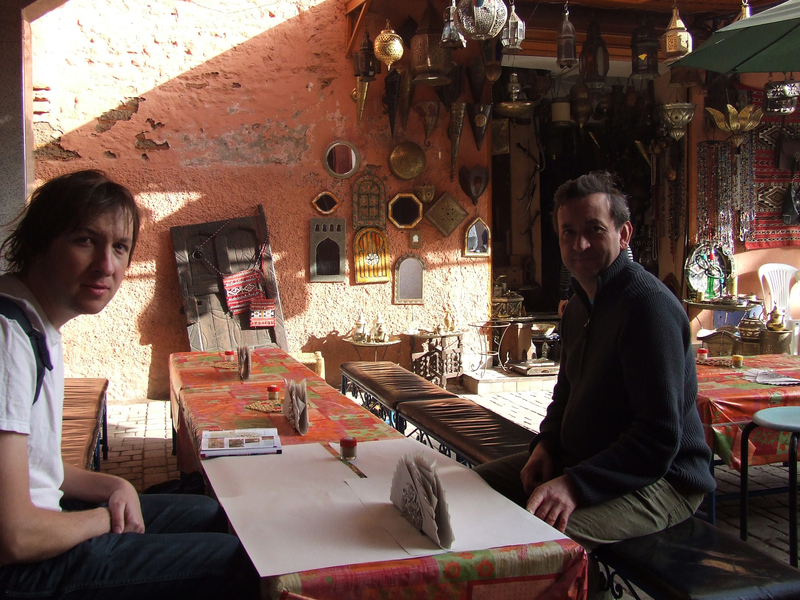 The most interesting part of our stay was next morning at souks. Souk or souq is a arabic/muslim term for street market or part of the market. Entering the souk feels like being taken to One Thousand and One Nights (Arabian Nights). The amount and colors of products displayed is overwhelming. The temptation to buy is never ending. We got to the market early so still not all stalls were opened but also not many traders stopped us on the way. First all kinds of houseware, tagines, lamps, jewelry boxes, plates, sculptures, carpets, clothes, bags, sharfs, shoes and many many more. Our eyes were glittering with excitement looking for little treasures. Then food; olives, spices, herbs, meat, fruit, vegetables we have never seen before… which made us hungry so we decided to eat some breakfast – tagine as you can imagine. In the middle of souks just next to a small mosque, away from Djemaa el Fna (main square) we found a perfect spot with paper tableclothes. We just sat there eating wonderful meal and drinking mint tea, thinking how wonderful trip it was and how lucky we were it was not a tourist season and traders didn’t nag us every second to buy something (as it happened in Vietnam). We were not tired by people, we were happy and didn’t feel like we were treated as a piggy bank by locals. In Djemaa el Fna we saw snake whisperer and water seller in a traditional costume, who nowadays charges for having his picture taken. And so it was that we got up and left the city of Ouarzazate with it’s film studios and memories of films such as Gladiator, Lawrence of Arabia, Kundun, Kingdom of Haven and many more. We took the Tizi n Tichka road and soon enough felt hungry. Not even 20 km away we stopped on a petrol station to have some breakfast. Tagine! as you can imagine. Yummy, but we had to wait for it for ages. First glimpse of ksar was unbelievable. Sand stronghold in the middle of sand townhouses, all like it was part of the desert. 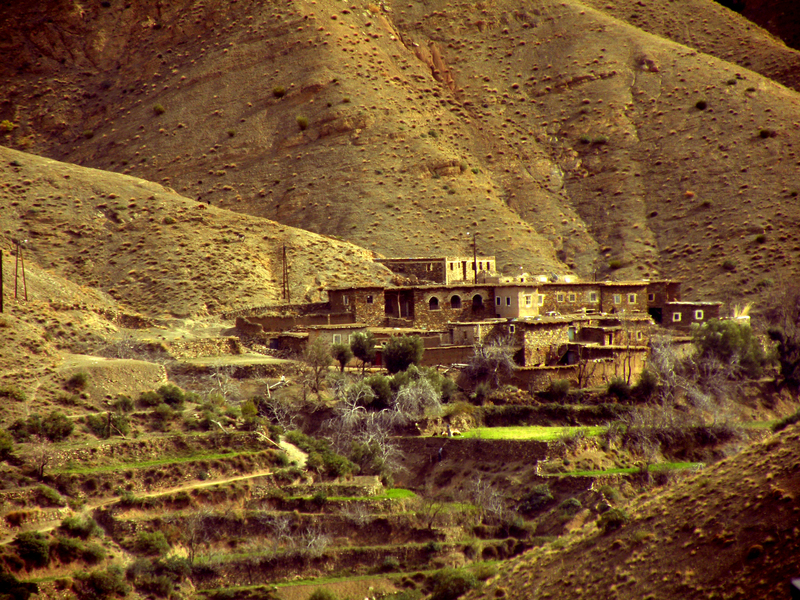 Around strips of color, stains of green and towards the skyline whites of snow in Atlas mountains. Above it all clear, clear blue of the cloudless sky. First thought: ‘How beautiful’ Second: ‘How did they build it?’ Third thought: ‘Like town from Stargate’. We got a little bit further and the ksar was suddenly mist over by new town where tourist business flourishes. 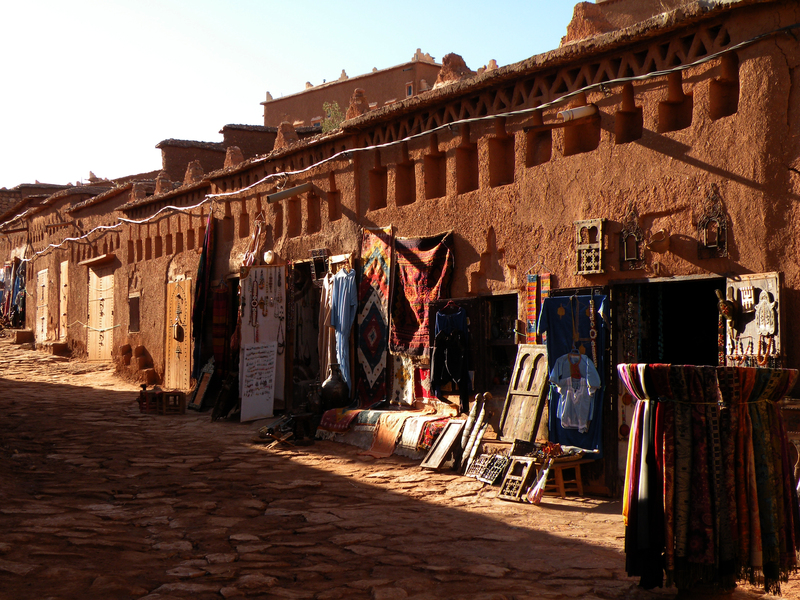 We took a cobblestone street towards the wall and gates of Ait Ben Haddou where as you can imagine all shops are located. They all look lovely but we were in no mood for shopping. We felt impatient to see the ksar again. One of the men on our way was very persistent, he asked us to translate a letter he received from a customer from our country. He wanted us to drink tea and spend sometime with him but we were suddenly in a hurry. We did translate the letter in the end but “promised” maybe to buy something on our way back. And there it was just in front of us on the other side of the river. River???? Yes about knee deep but still a river, locals will charge 10Dr to cross the river on a donkey (or let wellingtons), they probably removed the stepping stones to improve their business. Anyway we took off our shoes and crossed to the other side. From the main gate we followed a labyrinth of stairs, houses, paths, roofs to get to the top. It felt amazing, like bieng kids in the playground. The light, sun and shadow everything was so picturesque. While inside it was dark and cool when you step outside to one of the roof is was bright and warm. It took some time for the eyes to adjust. I didn’t think about the people who used to live here years ago, what they did, if they were happy. I was more concentrated on finding out what was behind the next door, stairs, corner. We climbed up, up and up until finally reached the top of the rock. The view did not disappoint. someone will pick us up? who? when? where? We kept to one side of the wall, changed clothes and talked over and over about what happened the day before. Finally a car pulled over and took us to Zagora together with 4 other people and the driver. Feeling of regret that we have to go back was overwhelming. The road now so familiar seemed at least fifty percent shorter and not long after we set off we were back in Zagora, same place but we somehow different. Experienced, changed and hungry! I think we ate the best meal I can remember. Tagines, (kefta for me), bread, eggs, olives… made us want to lick the pots and kiss the chef’s hands. Ah and the tea. Let’s talk about food a bit more. A typical meal begins with salads, followed by a tagine (tajine) with bread and finished with a cup of sweet mint tea. 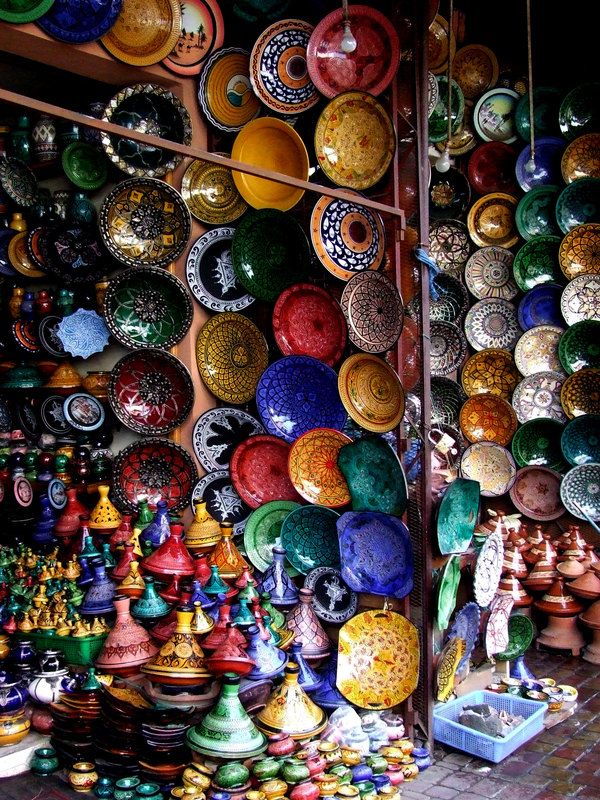 Tajine is a name of a dish but also of clay pot in which it is cooked, sometimes painted or glazed. There are two parts: a base that is flat and circular plate resembling, and a large cone or dome-shaped cover that rests inside the base during cooking. The cover is so designed to promote the return of all condensation to the bottom. They bring it to the table covered and then remove the lid so the dish is very worm and the aroma penetrates your nostrils. Most common tajines are beef, lamb, kefta, chicken and couscous. The dish is cooked for a long time in low temperature and the meat is just amazing, tender and never chewy. Lamb is falling off the bone. My personal favorite is kefta tajine served with egg. Yummy! Tired but happy and full we started to think what to do next. Where and how to go. Missed the one we would need to take. -Yes, taxi why not, in the end locals do it, it can’t be that expensive! It was expensive to rent the whole taxi though, old Mercedes can fit 6 passengers: 4 at the back and two in the front seat plus the driver. The taxi stop was a “no shadow only burning sun” square with plenty of people around but none going to Ouarzazate . We waited and waited for our taxi driver to find other clients. In what seemed like eternity (and was probably 3 hours) he found one! But we had had enough! Paid for 5 people instead of paying for three and left the town behind. On the way to our destination we couldn’t thank God enough there were only 4 passengers in the car, the heat was unbelievable, the space was small and the turns in mountains rapid. Views astonishing. No pictures this time you need to go and see it for yourselves. Now we had to find a place to sleep. Cheap. It was getting dark and we didn’t know French. We skipped fancy looking hotels with palm driveways and swimming pools and drove towards poorer looking area with some hotel signs. Everywhere I went I had to draw how many beds, rooms I need. The small piece of paper i had with me was being covered with more and more detailed drawings on the way. Finally we found a six bed apartment with wet room and kitchen for three of us for $10 (not per person, per apartment) … we had to say we were married though… ah well. Our windows overlooked a large plaza and a mosque but I can’t really remember it being a problem. Once settled and showered we went to the center to find something to eat. The feel of main square in Ouarzazat was very European. It reminded me a bit of France but with a lot less people on the streets. I decided on couscous with vegetables, bad choice. We walked a bit around the city but after the less populated towns we’ve seen Ouarzazate seemed just too touristic. Nothing compared to Marrakesh as we will later discover. I have to say Goodnight for now and see you next time. The road leading to the desert is suitable for only one car, to pass anyone on the road proves to be very difficult. On the other hand there are no ditches on its sides making it easy to drive on the verge. Easy, but also damaging to the car’s body. While driving you can easily imagine taking part in those famous car duels out of American movies. We got to the backyard of a sandstone house with stables where the camels where waiting to take their cargo – us. Yes, they smell, but it’s not as bad as I imagined. Have a look at the picture below and tell me if you don’t think that my friend in white turban looks like Passepartout. Getting on the camel wasn’t too difficult, hanging on to the saddle when they get up wasn’t bad as well, it’s mostly getting off you should be careful about. We set on our journey: three tourists on camels, one Berber on foot and a dog on its four paws. As we set off from the village of Tagounite there was a lot of palms, bushes and all sorts of greenery, the further we went the less plants and the more sand was starching in front of us, but only when we got to the camp we could see the rock desert I came to see. Don’t understand me wrongly, sand dunes are so romantic but have nothing to do with how most of the desert looks like. The camp consisted of four sleeping and one dining tents (also we were spoiled with a toilet further away from the camp). All tents were made of camel blankets stretched on wooden poles and secured with ropes. We loved it the second we saw it. As you can imagine we played among the dunes like little children, rolling down the dunes, jumping in the air, running around and playing with our footmarks. The vast space was incredible. The sky enormous and blue. And then when we got tired we sat down on the top of the highest dune and drank moroccan tea, thinking of things that can only be shared in moments of beauty. Unforgettable. The night on the desert made me fall in love with Africa. I know people say it all the time and believe me there is no point in me describing it, you have to experience it yourselves. There are so many stars that every now and again you can see one falling down. Imagine how many wishes can come true. We sat by the bone fire after supper and watched the fire burn. No one felt like talking, what can you say? We met a woman who lived in one of the other tents. She came for a one night like we did, but then felt the urge to come back and now she had been in the camp for last 6 days. This is the magic of the desert, peace. The night was terribly cold, I slept in all my clothes under 2 blankets and duvet but I still was cold. The tent seemed like a penthouse comparing to what we are used to. I didn’t dream that night I woke up every now and again to think how cold it was and to fall asleep again… well in the end it was January. We arrived in Zagora at 9am. Beautiful morning. During the last hour on the bus I admired the view outside. We seemed to be driving along river which banks were covered with green palm trees and sand buildings. Something I never have seen before. In Zagora the bus station is located outside the town center and we didn’t really know what to do when we got off the bus. Take another bus, wander around and if so in which direction? Finally a man standing outside the building asked us if we need any help and told us to follow him along board but empty street. We wanted to make sure it leads towards center but English didn’t help much. Uncertain we followed the gentleman down the street. As you can expect he lead us straight to a tourist agency which wasn’t even open yet. January is not a peak season in Morocco so there wasn’t many people around. They opened the shop for us and presented a thick and well used notebook of testimonials. Clients who wrote their comments and recommendations came from all over the world. We bargained over the price of overnight stay in the desert and paid deposit in advance. We arranged time when somebody would pick us up and drive to a place where we could mount the camels. You can choose from multiple tour options from means of transport like: camels, quads, jeeps; time: one day, two day, seven day; group or individual; sleeping in the desert or in a hotel anything that can be customised is. In the meantime we decided to walk around Zagora and eat some breakfast. Sitting in the cheapest place we could find, just off the main street we observed everyday life. Kids playing ball, adults walking about their business, men drinking mint tea. Now, when I think about it everything was so quiet and the air was so clear. The narrow streets were sandy and some times muddy, we saw a couple of carts with donkeys carrying cargo, people and food. On the way back we walked into a souk (shop) with all the tourist treasures you can imagine: lamps, clothes, jewelry, daggers, carpets, jars, pots, pictures and many, many more. We made our mind and sat down to bargain. We were offered traditional tea and while drinking the owner of the shop ensured us we don’t have to do the business “If buy it’s good, if not buy it’s good”. If you have ever been bargaining you know the whole dance: we sat down, just to get up to leave, wanting to take something just to change our mind in the next minute, choosing different objects and exchanging one for another as the price was going down, to finally to close the deal with a pen and aspirine. Tip2: For bargaining purposes take with you something you can leave without regret (a small souvenir you can seal the deal with) depending on how much you want to buy you may wish to take more than one. We bought among others clothes in blue and white to cover our heads while riding the camels. Before it was time we went back to the agency and used their bathroom to wash ourselves after the night on the bus. Our cab arrived. It was a really old Mercedes with windows covered with clothes not to let the sun in. Our driver was chatting and smiling all the way to Tagounite and stopped at one point to allow us to take first pictures of the rocky desert and oasis. We were listening to Berber music and looked around with our jaws open. Now I’m not really sure how many of you have heard about it or seen it. Since I visited the site last year I wanted to share pictures and my amazement. 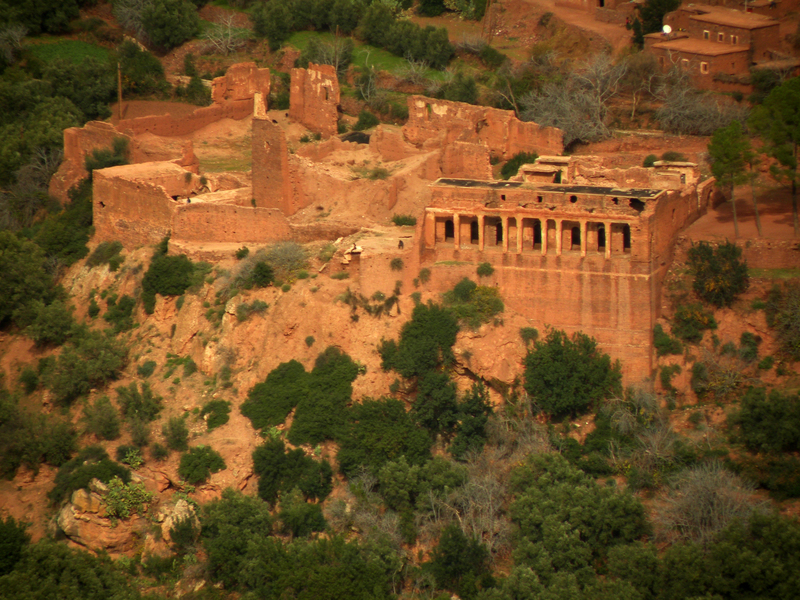 Ksar of Ait-Ben-Haddou is listed on UNESCO World Heritage List and I would never have known it if I didn’t go there by accident really. We were bound to Agadir and wanted to see the desert. No other plans, no pre-bookings, we decided to get there and make choices as we go. Tip1: Remember to fill out the landing card on the plane. You should get it from the crew, if you don’t because you are fast asleep; make sure you ask the flight attendant for one. Our trip started at 7pm outside the terminal building in Agadir. It was dark but warm. In the yellow light of street lamps we saw dozens of empty taxis just waiting for customers. The drivers were not. They were chatting away, shouting to each other barely paying any attention to us. After traveling in Asia we were inclined to look for a bus or a “mini cab” to save some money. None of those were present. Eventually we tried to bargain but ended up paying full price according to the price list clearly visible on a public board. We took taxi to the bus station as we figured there is no point in staying for the night in Agadir. We didn’t have any accommodation, we didn’t want to stay on the beach, and we would have to take a bus or rent a car the next day to get to the desert. And so we ended up on a very busy, asphalt square with small pavilion at one end and few waiting buses. As you can imagine no one spoke English but we were able to buy tickets to Ouarzazate. The bus was only due in a two hours or so. We reluctantly left our luggage in the ticket office, to have a look around the neighbourhood. Felt really unsafe even with the two guys on my sides. Finally we ended up back in the bus station having our first Moroccan dinner. The food was alright but the tea was phenomenal. The waiter didn’t just serve us tea he showed us how it should be done. He brought a small pot with tea leaves and boiling water already inside, three small glasses, mint leaves and sugar. All I remember now is that we had to wait quite long for the tea to steep (almost thought the waiter forgot about us) and then watched in amazement how many times he would pour the tea to small glasses with sugar only to pour it back to the pot and start the process again. It reminded me of Barcelona Magic Fountain show. Before the final round he placed some fresh mint leaves in each cup and poured from a distance to produce foam on the tea. It seems that the higher the distance the more proud the master of ceremony is. We took bus at 10pm to Ouarzazate and tried to fall asleep as it was so dark you couldn’t see anything outside. The bus had only one stop in front of a carpet shop before arriving at 4am at the destination. We got off the bus and stared in amazement on empty city around us. You did not hear any noises and the lamp light was only limited to the bus station. No hotels, no shops, nothing just bare walls and windows of buildings which to us seemed abandoned. We went inside the bus station building and found opened cafe. Not sure what to do we order some coffee (suspiciously European) and boiling water (no tea available). Besides us there were three other gentlemen sitting by the next table, they were watching something on TV and speaking in a language we could not understand. Suddenly one of them decided to chat us up. Then he tried French, Pawel told him in French (the only one who can speak the language a bit) that we speak English. I (as a woman) was trying to melt with the background – never happened to me in any other situation before. But he didn’t give up. At some point we agreed that traveling through desert is better with car because camels stink. We still wanted to ride camels, but didn’t want to argue our point. First opportunity to leave the cafe was ours and when it presented itself it gave us a chance to jump on the bus to Zagora, which we gladly did.